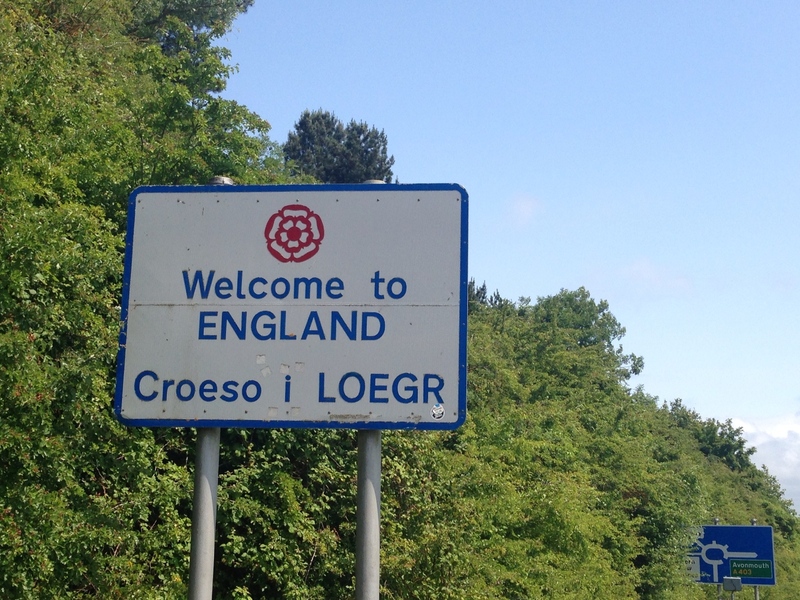 A good days ride covering approximately 85 miles, and getting back into England. All too quickly it was time to get up after a very comfy night in a proper bed again; nice not to have to pack up my tent though, and nice to have another set of clean clothes post my washing drying. Rachel had to leave for work fairly early, so I bid her goodbye, however handily Ian works from home as a Games developer so I had time to ease into the day. After having a leisurely breakfast and a chat with Ian I packed up and was ready to hit the road. Thanks for the stopover guys! The weather looked acceptable if a little overcast as I pedalled off. Ian and Rachel had recommended a bike shop just down the road in Whitchurch, Damian Harris Cycles, so I made that my first stop. Unfortunately it started drizzling on my way there, but I had faith conditions were going to improve. Damian Harris Cycles is another great bike shop, with a friendly and helpful bunch of guys who were good to chat to. I bought a new rear tyre, another Schwalbe Marathon Plus, which they fitted for me. It was gratifying to see I’m not the only one who struggles to get these tyres over the wheel rim, they’re very tough but hard to fit as a result. I also picked up a few more spokes, non drive side, as I’d run out of spares. I compared notes with one of the lads in the shop on the west coast of Wales and its hills. He agreed they can be pretty tough, with steep gradients. I reckoned they were as tough as anything else I’d tackled to date, just because of their frequency and steepness. 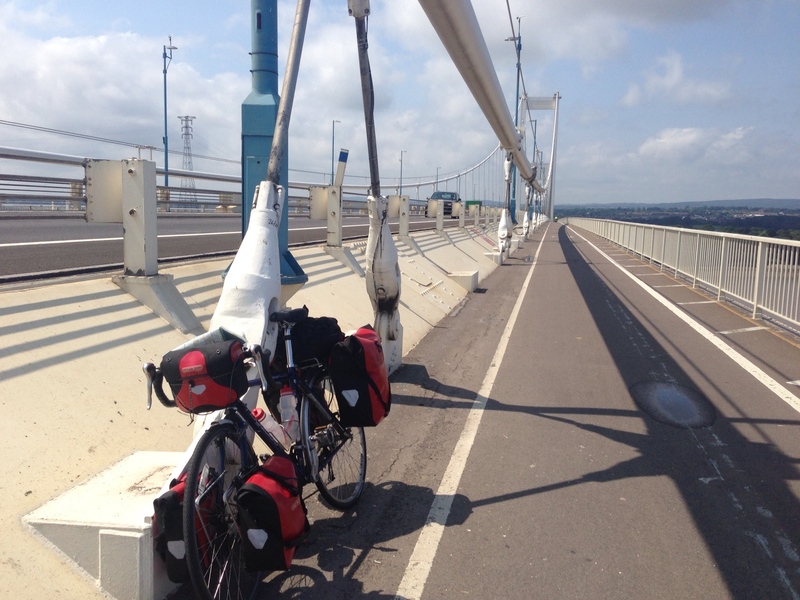 With my bike all rejuvenated I set off through Cardiff, targeting the Severn Bridge to get back into England. I rode past the castle, and stopped at a Greggs in the main shopping area to load up with bakery goods to keep me going, plus a second breakfast of a pizza slice. 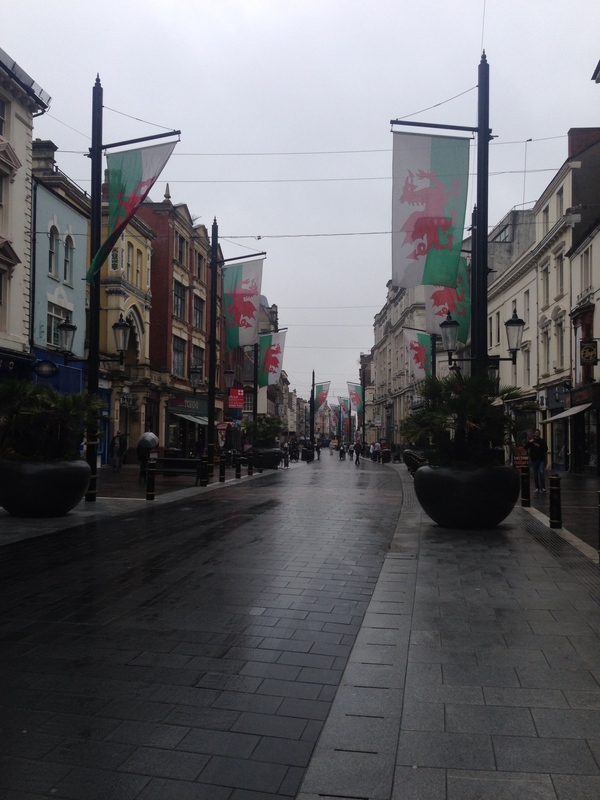 Cardiff’s another nice city I need to go back and visit properly another time. There followed a slightly convoluted route to get out of Cardiff, via Splott, a cool name for a suburb. 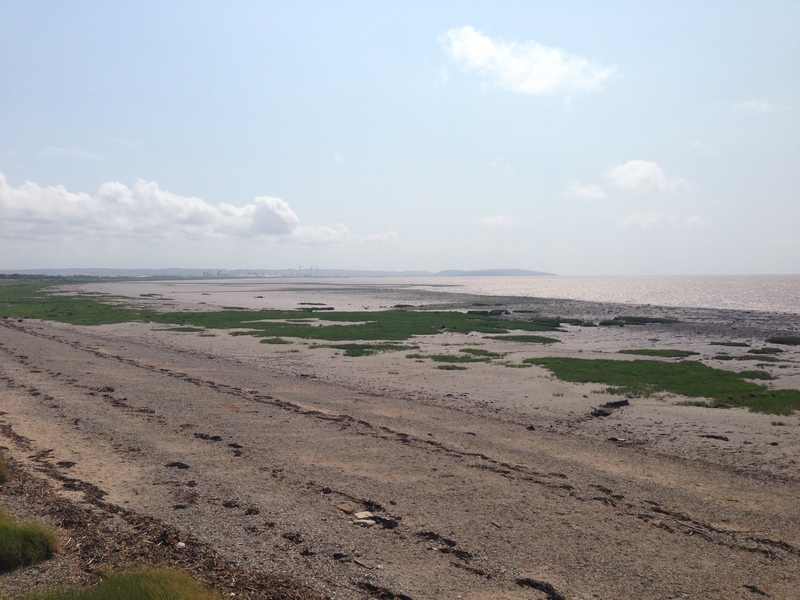 I eventually made it on to the coast road, after a couple of wrong turns, and pedalled up the Welsh coast alongside the Severn Estuary. The road was being turned into a dual carriageway, with large sections coned off. It was great to cycle on, being light on traffic and lovely and flat, with new tarmac. A rare tailwind helped be along, through various industrial areas to begin with, then some nice countryside all the way to Newport. The rain stopped as I rode over the bridge into Newport, but then got a bit turned around in a maze of roads and confusing signposts. I stopped at a greengrocers to buy a few bananas and apples, and checked my map with the store owner to make sure I was on track. Thankfully I was still going roughly the right way and was soon on the road to Magor, then on to Caldicot via Undy. All the towns had their names in Welsh on the entry signs as usual, but I still didn’t have a chance of pronouncing them correctly most of the time. 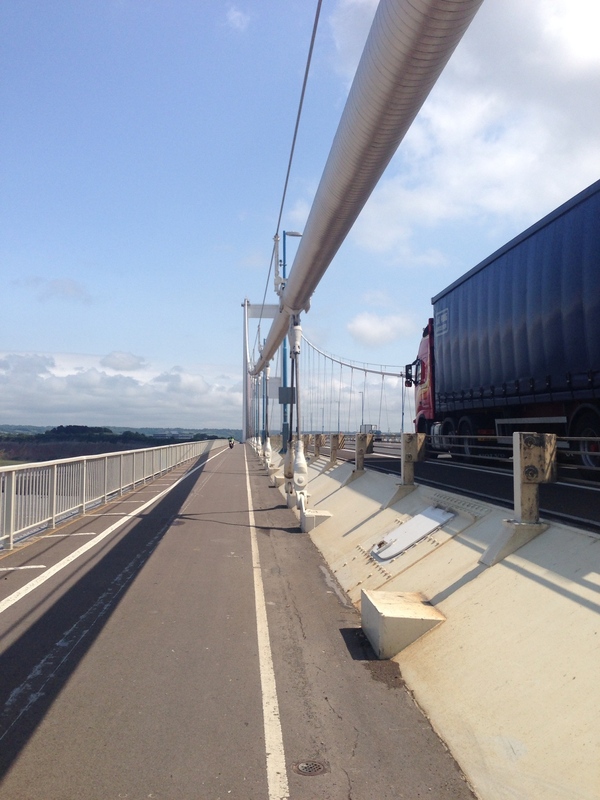 I’d been following route 4 (CTC) on and off all day, and pedalled to Pwllmeyric just before Chepstow, having to tackle a steep hill before turning south to cross the River Severn. 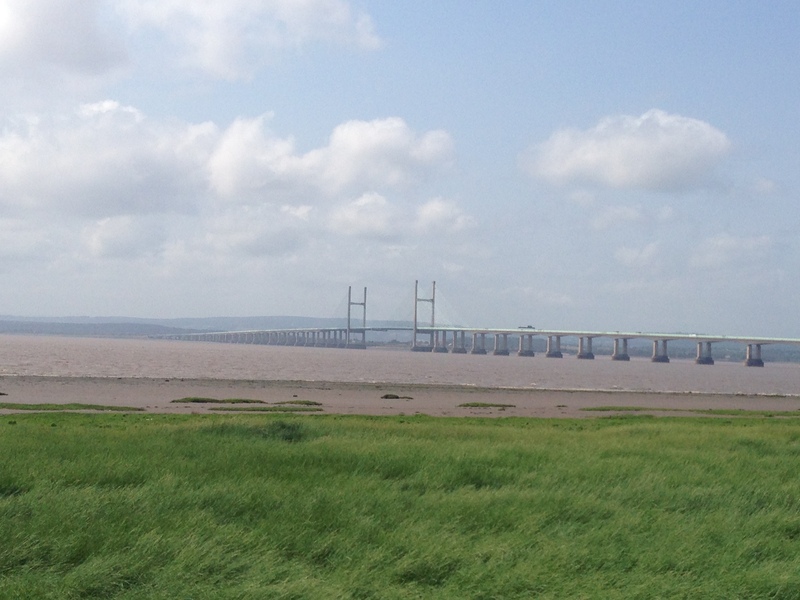 I was going to cross using the old Severn Bridge over which the M48 passes, as it’s open to bikes. Using the cycle path over the bridge saved me a long track inland to Gloucester, and back down again. I passed a moped going the other way, so they obviously don’t mind small motorbikes using it either. There was a team painting the bridge as I crossed, which must be a pretty much permanent task. The bridge was vibrating from all the traffic zooming over it, just yards from the cycle path, a weird sensation. I stopped for a quick break on the bridge, looking back towards Wales and then south to England. The clouds were breaking up and the sun coming out. After having to endure bad weather for much of my time in Wales it was apt timing that conditions were improving just as I was leaving. After the bridge and village of Aust I tried, somewhat unsuccessfully, to stick to the small roads and tracks next to the estuary – several were looking quite promising with helpful signposts. 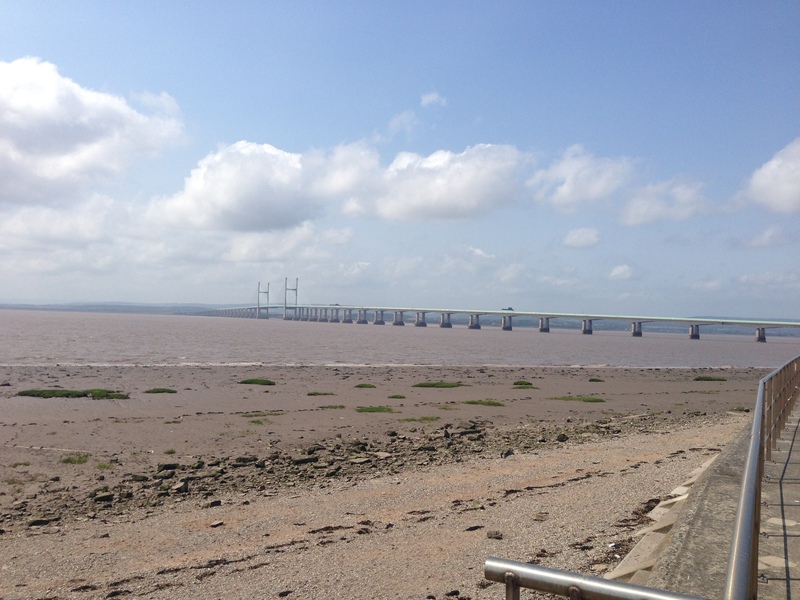 I passed through Severn Beach, but then ended up at a dead end and had to push my bike through a bit of a bush to get back to the road. This resulted in a few nettle stings but at least I was back on track, albeit with a few bits of vegetation sticking out from panniers. Either I’d missed a signpost or they’d done their usual trick of not being there when I really needed one. I blame Gremlins. 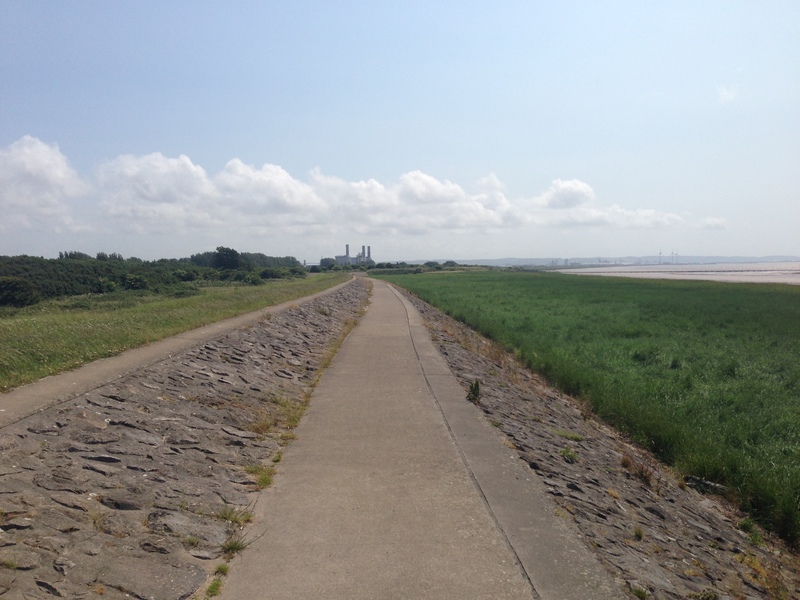 The A403 and a couple of quieter side roads and cycle tracks took me down to Avonmouth. The riding wasn’t a lot of fun, with a lot of heavy traffic, factories, fumes and impatient drivers. The impatient folk weren’t the lorry drivers incidentally, more the car drivers, especially the smaller cars – small angry man syndrome most of the time. I definitely needed a wide load sign on the back of my bike. I stopped in Avonmouth for a break and phoned Will, my brother, who was stuck up in Edinburgh waiting for a plane to be fixed. I sat in the sunshine chatting, eating a couple of bananas and a chocolate bar to replenish energy reserves, whilst watching a large number of heavily tattooed men and women go in and out of a shop. There isn’t a lot in Avonmouth, but body art seems to feature in a big way with the locals. A lot of it was pretty cool and got me wondering about a tattoo again, something I’ve been mulling over for a while. I’d quite like a small one of a similar design to the New Zealand green-stone necklace I wear, but think I’ll have to get a design done and put it up on my wall for 6 months to see if I get bored of it before making a final decision. 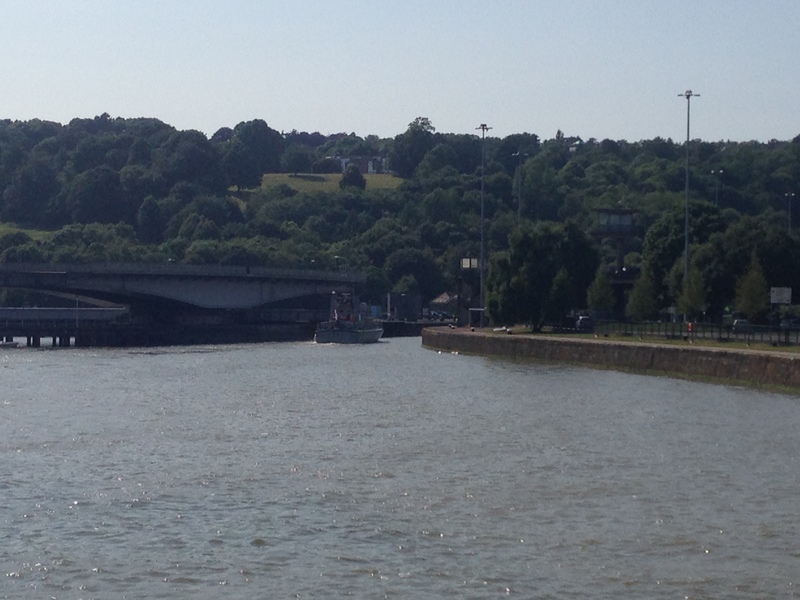 I had to ride towards and into the outskirts of Bristol next, to find a bridge over the River Avon. Thankfully most of the route was via cycle paths as the roads were very busy again. 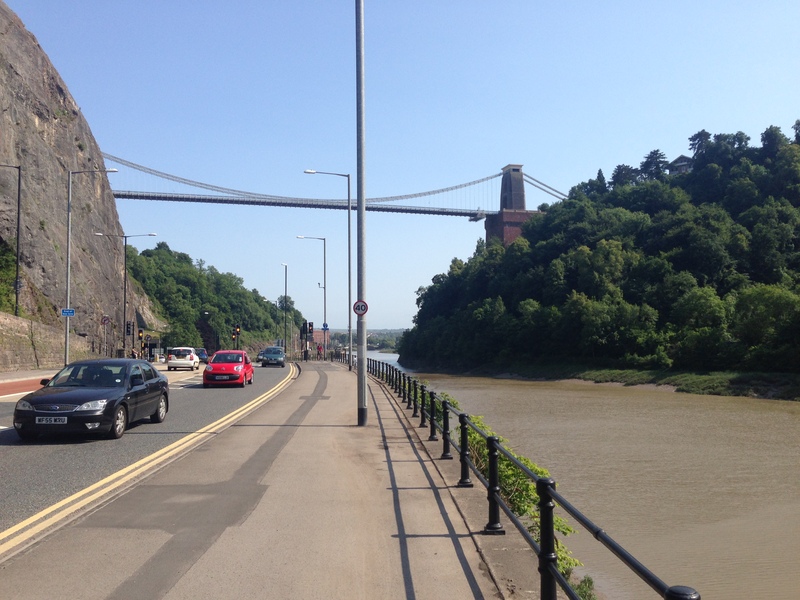 I pedalled up the A4 alongside the river, with cliffs on my left hand side at some points, and passed under the Clifton Suspension Bridge before crossing the Avon. The queues of traffic were pretty horrendous, but being on a bike I was able to keep to the cycle tracks and bypass them all for the most part. I took the B3128 back towards the coast and Clevedon, trying to avoid the busier roads, but encountering a big hill climb instead. It was lovely riding in the sunshine, which had stayed out since getting back into England. I could look back over the Severn Estuary into Wales and see a pall of clouds still hanging over the coastline there – that country does seem like a magnet for bad weather. I quickly came to the conclusion that all the roads were going to be busy, so just got my head down and pedalled, yearning for the quieter trails of Scotland. There were quite a few other cyclists out to wave to, including a few tourers going the other way who had the tailwind at this stage. After getting irritated by a succession of drivers coming too close to me in their haste to pass, I turned off the the B3128 and rode across to the A370, which although equally as busy was wider, and took me direct to Weston-super-Mare. 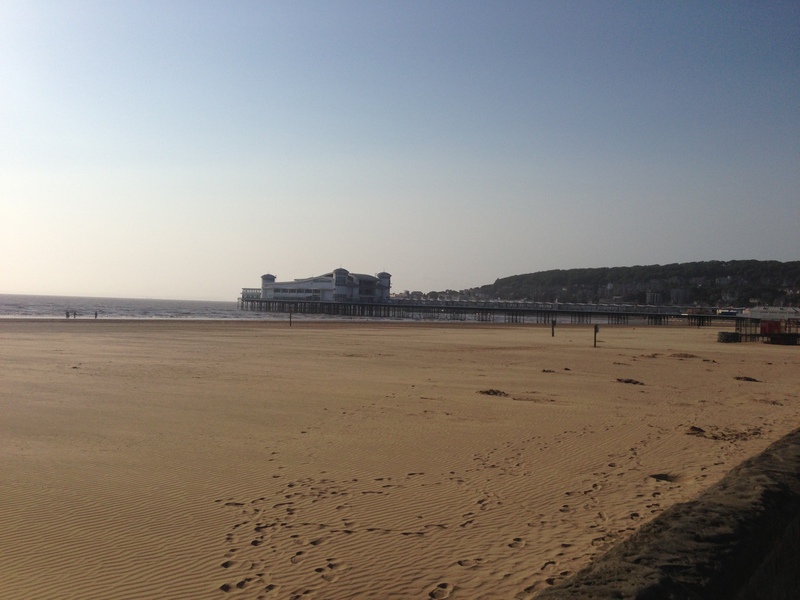 It took a long time to get into Weston-super-Mare from its outskirts, having crossed the town boundary several miles before I reached the town centre itself. 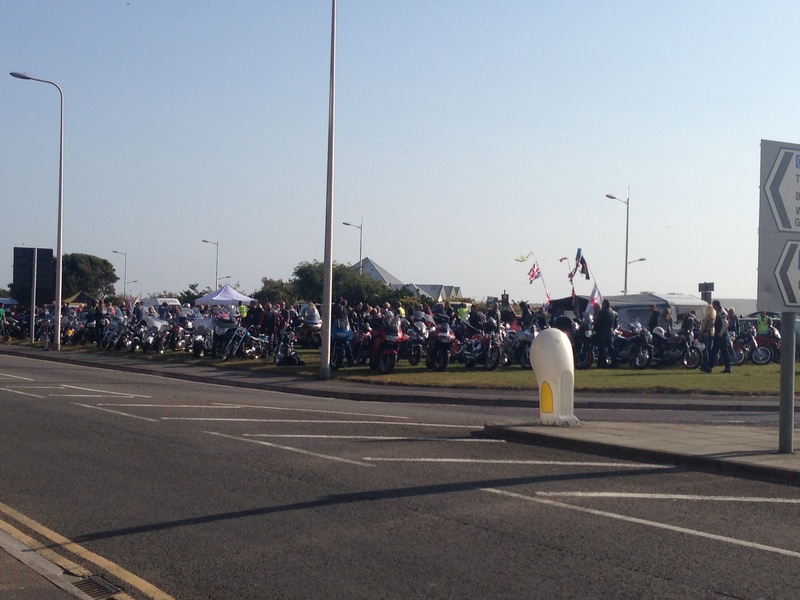 The road just seemed to go on for ages but I eventually made it to the seafront, where a big biker rally was going on. They had a DJ playing some really classic tunes, including music from Therapy, The Cure, and even a bit of Type O Negative which I hadn’t listened to in ages. There were a lot of bikes and it looked like a lot of fun; I considered trying to sneak in with the Ridgeback but I’m not sure it would have measured up versus a Harley Davidson hog. 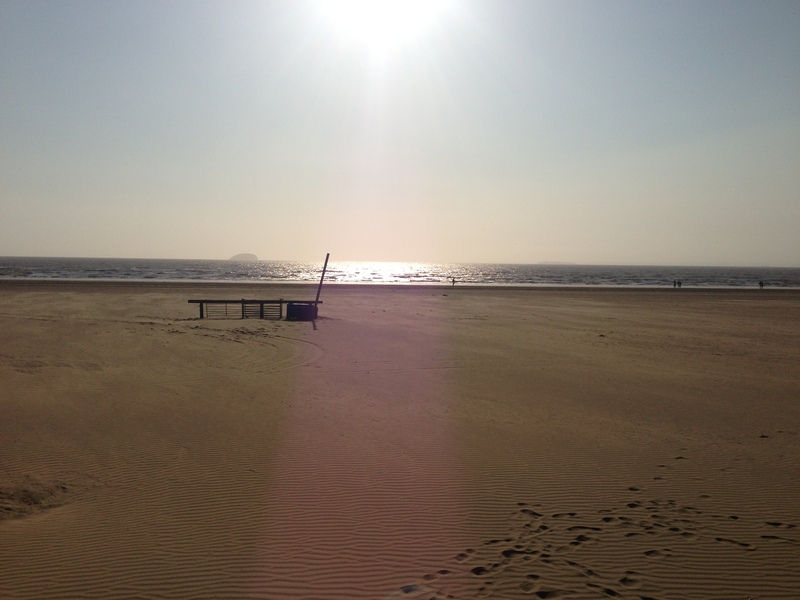 Instead I paused on the promenade and had a cold can of fizzy pop from a stall that was just closing up for the evening, listening to the music and gazing out across the sands. 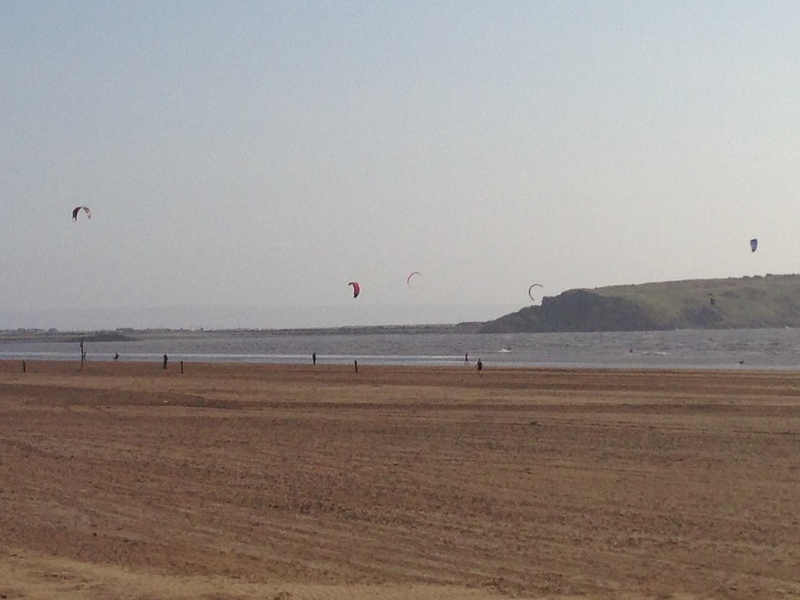 Refreshed and buoyed by the music I pedalled along the promenade with the sun gradually getting lower in the clouds, watching a few kite surfers out for an evening session. There was a stiff breeze so some of them were travelling along at quite a pace. I’m still not sure how they don’t decapitate one another with the lines to their kites. 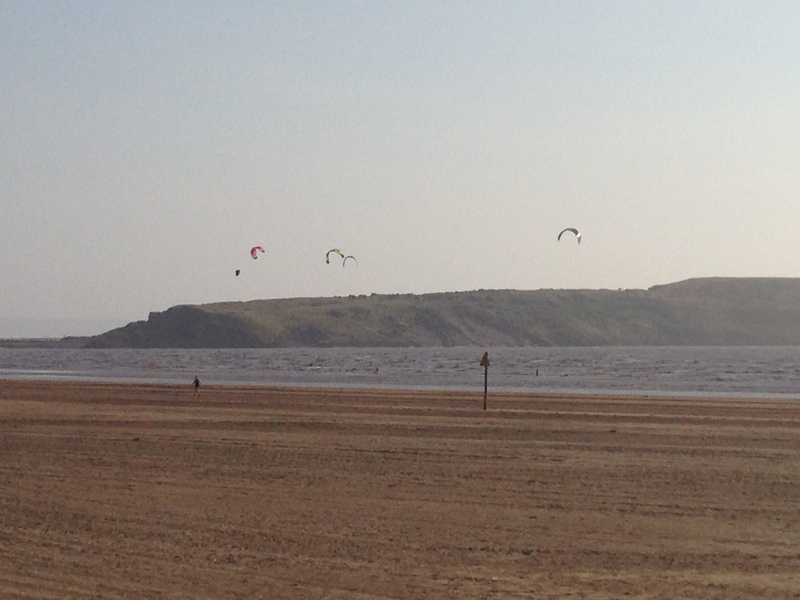 There were a few windsurfers out too, which seems like a safer option. 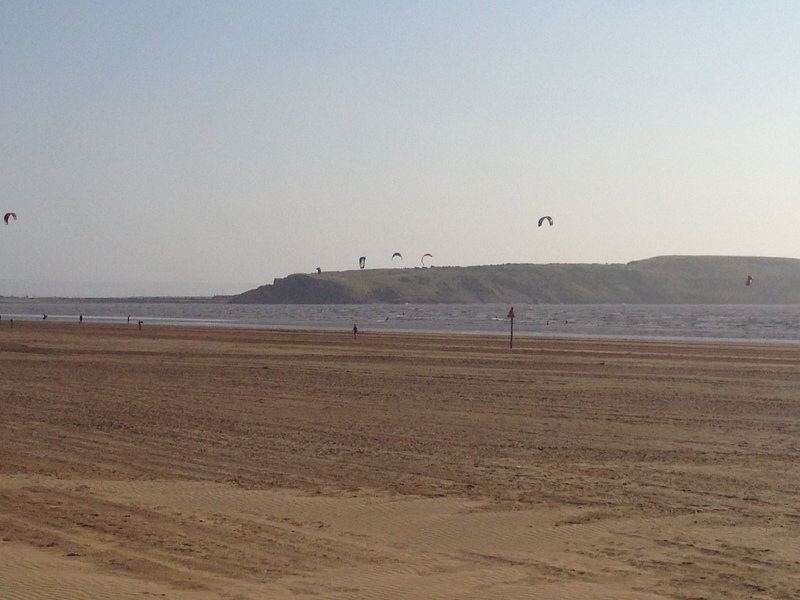 The on-shore wind they were enjoying was unfortunately whipping up a fair bit of sand and blowing it into my face and eyes, which stung a bit despite wearing sunglasses and pulling my buff up around my mouth. 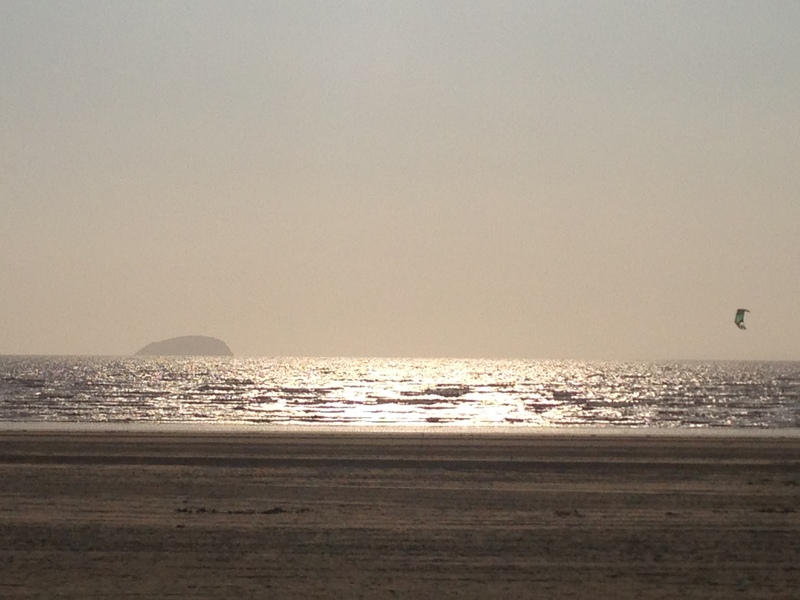 I think that’s Steep Holm Island in the photo above, out in the Bristol Channel, although it might be Flat Holm Island. Some rather wiggly roads came next as I made my way around to Brean and found a campsite, which turned out to be more of a holiday park, but only cost me £11. This was fine given it was now July and camping prices were going up. I quickly pitched my tent which blew about a bit, due to the increasing westerly wind and exposed coastline, until I got it pegged down. Handily the Hilleburg Akto is easy to erect, having only one pole you need to slide in. I’d had lots of practice by now so it was up in five minutes, and I adjourned to the rather plush toilet block for a shower. Plushest toilets of the tour! 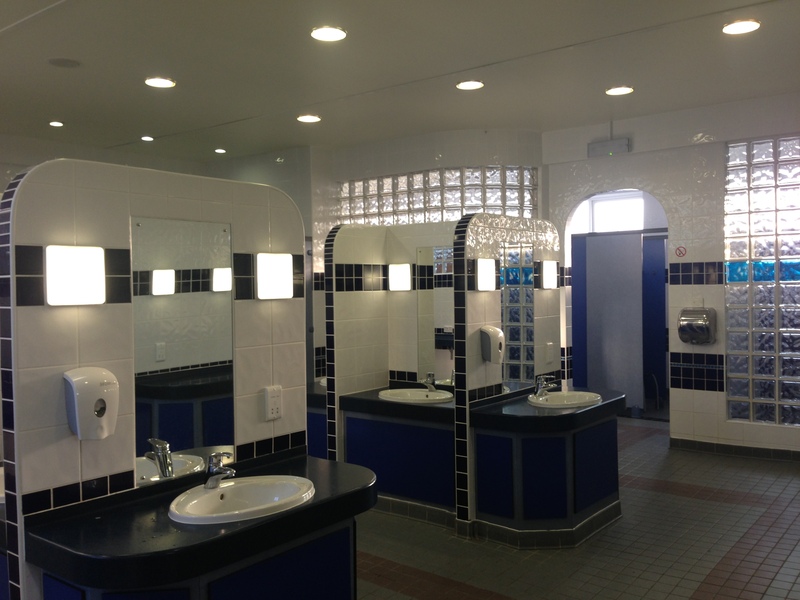 Now I’m not in the habit of taking pictures in toilets, but the facilities at the Warren Farm Holiday Park were pretty impressive. I almost felt like I needed to have a wash before using them. The Beachcomber Inn is just next door to the campsite, and part of the complex, doubling as the entertainment centre for the holiday park. With some trepidation I made my way there, deciding I’d eat out rather than cook something in the wind, but somewhat nervous about exactly what sort of entertainment they had lined up. They were just finishing the bingo when I turned up. I ordered a surf and turf dinner, as a treat, to celebrate the good weather (despite the wind) and getting back into England. Then I settled down to write my journal and watch a few of the acts. An ex X -Factor singer there on holiday was called upon to do a couple of numbers, he wasn’t half a bad singer but I prefer real music with real musicians; pity he didn’t do a few of the songs being played down the road at the biker rally. The highlight of the evening were a couple of comedians, one the straight guy, Tim, and the other the funny guy, Tony. Tony was impersonating an Albanian working at the holiday camp, ‘standing in’ for Tony who was ‘late’. They were really good and I genuinely laughed throughout the show, which also contained a few sing-alongs, and a bit of audience participation. 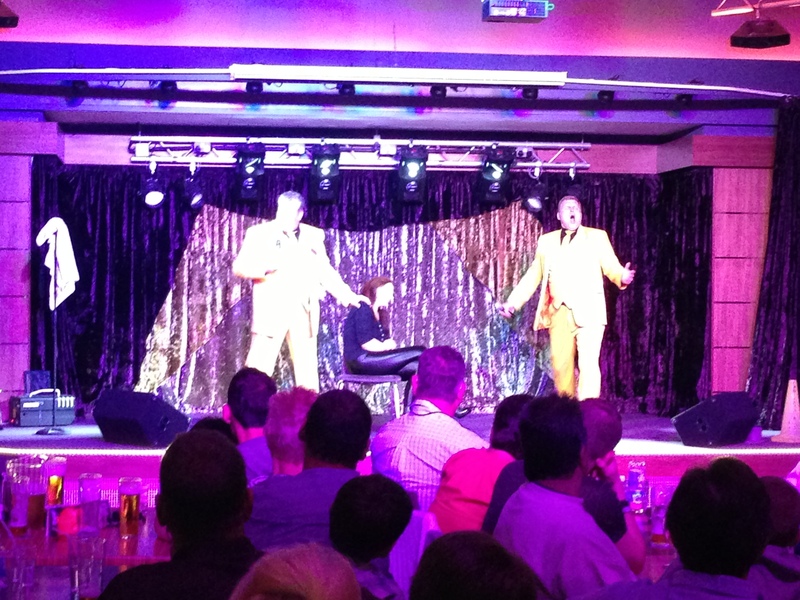 All in all it was a great evening, and made me realise not all holiday camp cabaret experiences are awful. I also chatted to a few of the holiday makers there, including Pauline who kindly donated £10 to the Big C, thanks Pauline. She’d been coming to the holiday park since 1975 and told me a few tales, and got me a ‘shout out’ from the compère for my tour which was nice. Post a rendition of ‘Oh Mandy’ and ‘That’s Amore’, and the Albanian worker upstaging Tony, the show was over and it was time to retreat back to my tent. It was my birthday tomorrow, so I had my fingers crossed for good weather, and was looking forward to meeting up with my parents who were travelling down from East Sussex to visit – fingers crossed for some free food! 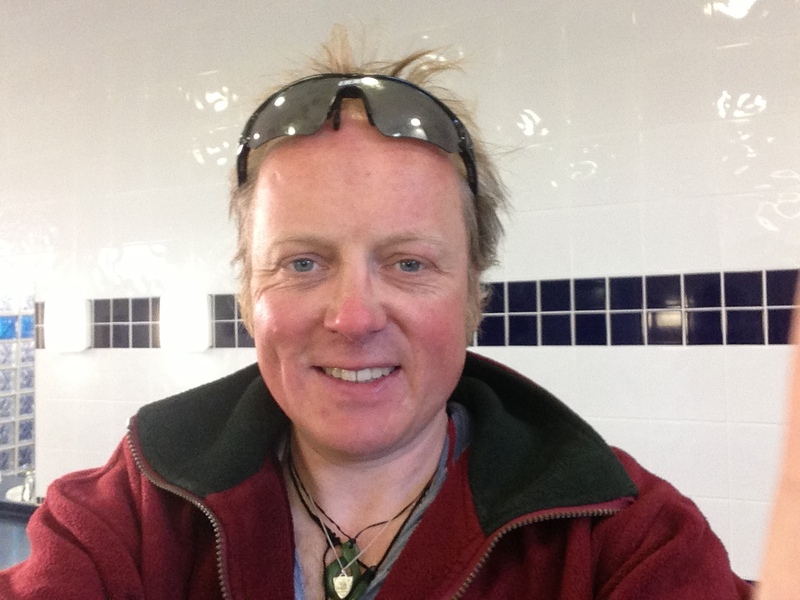 This entry was posted in Bike around Britain 2013 and tagged adventure, bicycle, bicycle shop, bike, Bike around Britain, Cardiff, charity, countryside, cycle, cycle touring, cycling, expedition, fundraising, outdoors, Wales on September 8, 2013 by SelfPropelled. You’re most welcome back to Cardiff if you’d like to visit for longer.